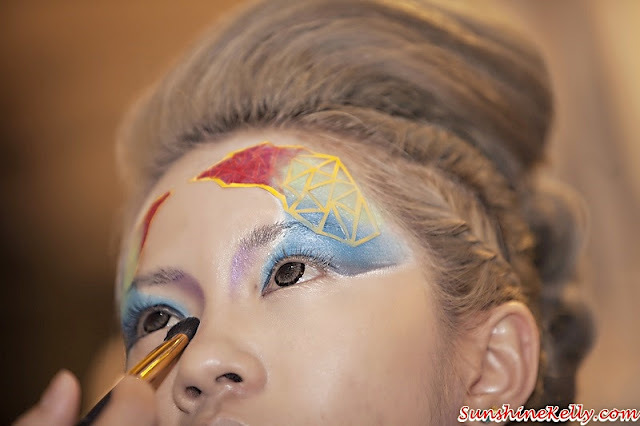 The Top 10 finalists of shu uemura Haute Street Beauty Art Make Up Competition 2015 pulled out all the stops to impress judges with their individual make up design and techniques at the Grand Finals Competition held “live” at Mid Valley Centre Court. This year makeup competition theme is Haute Street, an exciting showdown of the finalists’ skill and creativity. The finalists of were given 20 minutes during the Grand Final to create a look using colours from shu uemura’s Vision of Beauty Collection Vol.02. They were judged based on the overall look that they created, creativity of using the colours from the Collection in line with the competition theme, colour composition, make-up skills and artistic flair. The top 10 finalist were chosen from the best 15 entries during the Semi Finals that was held last month at Studio Verve. All the contestants has their own uniqueness and creativity but those with the outstanding beauty art and according the theme will make it to the finals. That night shu uemura Malaysia also launched the new Vision of Beauty Collection Vol.02, the event kick-started with a make-up performance by shu uemura Malaysia’s Master Artist team. Led by Malaysia’s Elite Artist & Education Manager – Lisa Yap, they wowed the crowd with their creative interpretation of ‘Haute Street’ make up. Live make up and art performance by shu uemura’s International Artistic Director - uchiide, who performed alongside New York based artist – Oyama Enrico Isamu Letter, the artist who designed the package art work of Vision of Beauty Collection Vol.02. Uchiide who created the Haute Street Collection, awed the crowd with his swift and precise artistic demonstration of haute street makeup. Grand Prize Winner: Cheong Hui Kuan from Kuantan won a return trip to Tokyo, Japan, an exclusive invite to a shu uemura event in Tokyo, RM1,000 travelling allowance, Artist Edition brush set worth RM1,500, trophy and certificate. 1st Runner Up: Dean Ong Yeow Way from Penang won RM800 cash, RM1,500 shu uemura products, Artist Edition brush set worth RM1,500, trophy and certificate. 2nd Runner Up: William Yap Wei Li from Kuala Lumpur won RM500 cash, RM1,000 shu uemura products, Artist Edition brush set worth RM1,500, trophy and certificate. People’s Choice Award: Tee Ai Shin from Kuala Lumpur won RM800 worth of shu uemura products. Head judge for the Competition this year is uchiide, shu uemura’s International Artistic Director. Other judges included well-known and highly credible professionals in the local fashion and beauty industry such as Gillian Hung – President of the Malaysian Official Designer’s Association (MODA); Sheng Saw - leading makeup artist and Aster Lim – Managing Editor of Blu Inc Media.